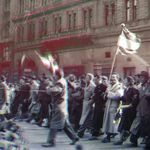 On the sixtieth anniversary of the Hungarian Revolution of 1956, the Vera and Donald Blinken Open Society Archives (OSA) has launched a series of public projects including two calls for applications for students and teachers. Youth under 20 are invited to develop innovative visualization solutions to rethink the events and memory of the 1956 Revolution using the digital collections of the Archives. Teachers are invited create projects that present the 1956 Revolution - the events, the goals, the consequences as well as the lessons learned, using primary sources of information, original footage, images, voice recordings and written documents.